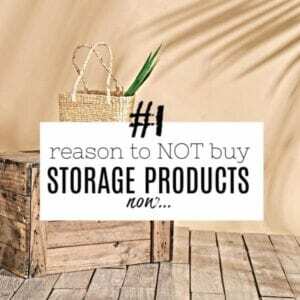 Let’s look at why you shouldn’t buy storage products now for your home. I know that they are pretty, and they promise to make life easier – but it’s not enough to just buy them, they need to work for you – so I want you to wait a while before taking the plunge. This post tells you exactly why…. Go to the homeware shops that I love, browse for a while, and then fall in love with something I didn’t know I needed. Only to get it home and realise it doesn’t work/fit/look right in the space I thought it would. It just adds to the clutter in the house, and I’m out of pocket. Not a great method of shopping, I’m sure you’ll agree. But I’m pretty sure you’ve done it too, at least once…. In fact, I’ve lost count over the years of the number of times I’ve wasted time, money or energy buying something that doesn’t work the way I thought it would. The lure of a pretty product in the shop tends to win my heart every time – and I’m a sucker for something that I think will work really well. The trouble with this is that this method rarely works. SO.MANY.REASONS – all of which boil down to one main point – and that’s what I want to share with you today. I really hope that it saves you time, energy and money, just like it does for me now – it’s a game changer to say the least! If you haven’t done the work beforehand to know what you need, then how can you know what storage to buy? Sorting out any space never starts with shopping. There’s nothing worse than buying storage items and trying to make them fit a space, only to find that they are adding to your frustrations rather than taking them away. To be sure of what you need, the easiest way is to sort the space using my ADORE Method and plan, declutter, organise and only THEN look at buying products. That way you’ll be able to be a lot more clear on your requirements and you’ll be much more likely to make the right decisions. HOW DO YOU KNOW WHAT YOU’LL NEED? If you haven’t decluttered and organised the space yet, how can you know what will eventually end up being the right fit for that specific area? 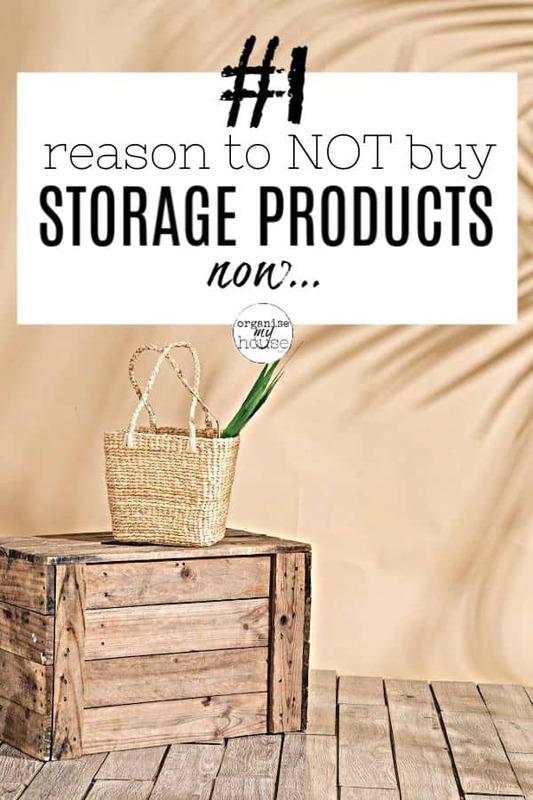 Oftentimes it takes 2 or 3 tries before we get the right place in our homes for things, and if we bought storage on attempt #1 we may well waste money by getting things to fit the wrong space. It’s always better to wait and live with where you’ve decided your stuff needs to go for a while before committing to it staying there. You may find the perfect storage item in terms of size and shape, but it may not be suitable for the job it needs to do. For example – You bought a gorgeous box for use as a memory box. It looks great and you’re really pleased with it. BUT – when you come to store that box, the best place for it is the garage. It’s accessible but out of the way for day to day life. The garage, however, can be damp – so storage in there needs to be water proof ideally. Your memory box is a fabric covered wooden box because you assumed you would keep it in the house and that you’d be looking at it each day. It now doesn’t work as it needs to…. Another example – you’ve bought a plastic container that’s exactly the right colour you’ve been looking for for a shelf in your kitchen. Your kitchen has a colour scheme and you’re ecstatic that you’ve matched it well. But you get home and realise that the shelf is a lot shallower than you thought, and the container doesn’t fit on it at all…. In both these examples, if you’d waited, then you could have saved yourself from the annoying situation. You could have known that you needed a waterproof container, or had the measurements to hand to ensure you were buying something that fit the space. Now you have to buy MORE storage that actually works, and you’ve created clutter with the stuff that doesn’t. Hardly ideal – you are making more work than necessary – all because you jumped the gun and shopped for storage before you should have. Colour/Style – will it be visible or hidden away? Measurements of what you are storing, and where you are storing it. Always try and have a shopping list of things you’re looking for when you go out looking for storage. Include the following and you’ll be sure of getting something that works. It will also help you to make quick decisions because you can clearly tick off what you need. What’s the size of the item(s) being stored? What’s the maximum space available where you want it to be stored? Does it need to be water proof / air tight / fire proof etc…? Does it need space for future additions? Will it be visible or hidden? What material would work best for it? Will it need to be carried around or pulled out? – How heavy will the contents be? THERE’S NO HARM IN A LITTLE INSPIRATION…. Of course, feel free to do some window shopping – it can give you great inspiration and ideas – and even help decide WHAT would be the best solution for your specific space. I particularly like using Pinterest to grab ideas for my projects, and my own pages have tonnes of ideas from all over the web with products I want to try, would like to use one day, or simply because I like looking! In fact, I should really write a post about Pinterest as an organising tool in itself – as its just so useful! – its like creating a personalised catalogue of ideas with direct links to the sites you got them from – perfect! You may have been wanting to organise a certain area of your home, and it may have certain restrictions (no storage space, ugly items etc…. ), and you may just stumble upon someone elses way of dealing with exactly your problem – FANTASTIC! Or you may simply stumble upon an idea that would work really well that you have never even contemplated before. Organising products are in the main all so beautiful. They are always packaged really nicely, draw you in, and make you want to buy them – just like new clothes do. They hold a promise of a new way of life, a streamlined home, and somewhere that you can open all the cupboards and find everything stored away, labelled and straightened out….. – which is very tempting to anyone I’m sure you’ll agree. A pretty box ISN’T necessarily right for what you need. Buying things because they are pretty usually makes for a distraction to your overall goal. You first and foremost need to buy storage for how it works for you, so buying something just because it looks nice is not a good plan. They can distract you so easily from the actual functionality of the space you are organising – and just make the whole thing worse rather than better. Even after you have decided that you need to get some storage, and you know what you need, chances are you already have something that will work well in your home – you just need to go looking for it. YOU NEED TO WAIT UNTIL YOU HAVE ORGANISED THE SPACE BEFORE YOU BUY STORAGE, BECAUSE YOU DON’T KNOW WHAT YOU NEED YET. But, getting the right product for the right space in your home can genuinely be life changing in terms of how easy that area is to use once it’s in place. If you know what you need to store, where it will be stored, what dimensions are available, and whether there are any other criteria to take into consideration, then you’ll find the perfect storage for your needs. Storage that will enhance the system you have put in place rather than distract you. So – before you start another organising project, think to yourself that you need to do the groundwork first, and then and only then (and only if you really need to) should you go shopping! You’ll save time, energy and money – and you’ll love the results. P.S Want to know more about the A.D.O.R.E Method that will change how you sort all sorts of things, from a single drawer to your entire home? – CLICK HERE to go there next. Previous Post: « HOW TO ORGANISE A BATHROOM – 10 SIMPLE STEPS THAT REALLY WORK!